10 years later. I have to admit, one of the reasons I have forgotten about our wedding cake for so long is because, well, it wasn't taking up space in our freezer. Up until last year, it had been in my parent's freezer. And had they not had to replace their refrigerator, it probably would still be there. I didn't even know how it was wrapped, as my mom did it (per our cake lady's instructions) after we left for our honeymoon. So this pink blob has always been a mystery. In fact, up until a couple days ago, I didn't realize it was frozen with the real flowers from our wedding on it. The cake was wrapped in three of these pink bags. I'm not positive, but I am guessing the cake lady left them just for this purpose because they were the perfect size. Inside the bags, the cake was merely wrapped in foil. Unwrapping the foil was pretty exciting. It was one of the moments of truth (the other being when we actually tasted the cake). I unwrapped the cake straight out of the freezer and was shocked to find it had NO frostbite or ice on it anywhere. The poor flowers didn't fare so well, but given that they had been frozen for 10 years, it is actually amazing how good they look. In fact, as the cake defrosted, the flowers actually smelled good. I actually snuck a taste of the frosting once the cake was defrosted, so knew that at least tasted fine with no weird consistency or anything. But I was shocked to find the cake tasted totally fine. It tasted a little on the dry side, like day old cake...but certainly not like 10 year old cake. I'm still super impressed with how well the cake fared. I have to admit, it was fun watching my kids eat a piece of my wedding cake. I mean, we are talking about MY KIDS eating MY WEDDING CAKE! Little people that weren't in existence when we were married. Little people that have become so much a part of our story getting to enjoy something from our beginning, from our wedding. That was pretty neat. So if anyone out there is considering keeping some cake for an amazingly long about of time and still want it to be edible, its totally doable. And now that I think about it, I totally should have saved half the cake for our 20 year anniversary...do you think it would be ok if I dug it out of the trash (that it has been in overnight) and refroze it? Hahaha. LOVE this! And I'm not going to lie I totally teared up when reading about your kids trying it. That is pretty special! So cool!! Congrats again on making it to 10!! um, I'd say no to digging out of the trash. But I think you were kidding anyway? Thanks for sharing! 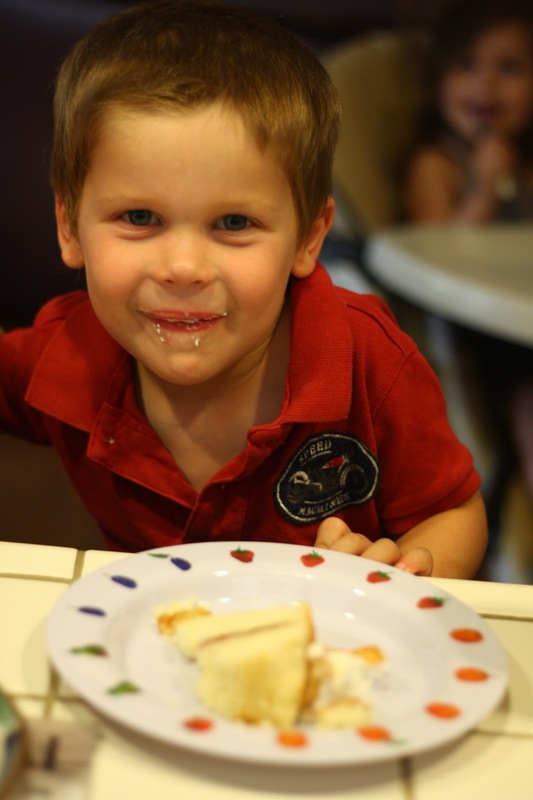 And it's so sweet your kids got to eat the cake too!